Screech. You know. The uber-rum from Newfoundland the Yarn Harlot is always talking about. I could use some. It seems to be very helpful in facing knitting dilemmas. Can you find the shoulder join in the picture? Do you see the uneven join and the big glaring holes? Of course you do, and don't be nice and say you can't find them there where the shoulder of the vest is draped across the arm of the couch. The live armhole stitchs are on the needle at the bottom of the picture. 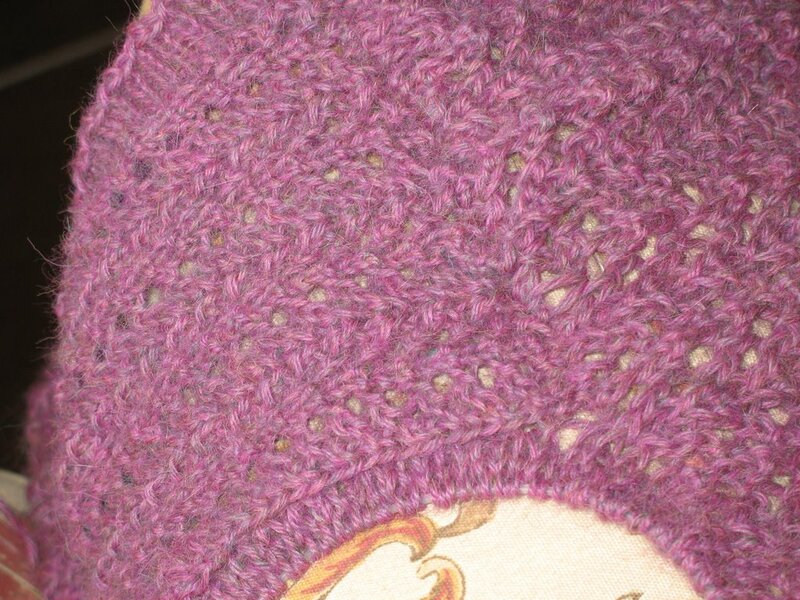 By the time I noticed how hideous the join was, I had already picked up the armhole stitches. Warning: do not attempt this in your own home. I am a professional idiot. Amateurs could damage themselves, the dog, or drywall. Begin with 30 shoulder stitches on the left front shoulder panel of the vest, right side facing. Work in pattern across row to end. Purl back to within 5 st. of edge. Wrap the next stitch and turn your work. **Work across row in pattern, turn your work, purl back to within 5 st. of wrapped stitch. Wrap the next stitch and turn. Repeat from ** 3 times, purl back. Do not break yarn. Line up 30 shoulder stitches on left front shoulder with 30 shoulder stitches on left back of vest. Repeat from ** until you have 31 stitches on the rear shoulder and 27 stitches on the front shoulder. **Surprise yourself by cussing with words you didn't know you knew. Reconstruct shoulder, incorporating lace pattern into shaping. Repeat from ** for 45 minutes. Scream in a deep and resonant manner. Pound vigorously on armrest of couch. (Pound on the chesterfield if you are in Canada). Watch terrified cats dive for cover. 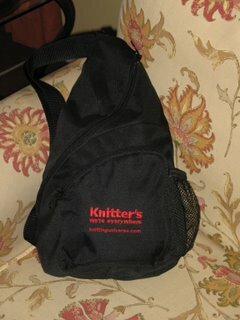 Cram wayward knitting into new bag which was a door prize at Stitches West. Stomp to pantry, only to discover that you have no adult beverage of any kind whatsoever, much less the fabled Screech. Ingest over-the-counter sleep aid instead. Go to bed. Wake up before dawn, reconstruct lace shoulder one last time in pattern, throw in nearest towel, use traditional 3 needle bind off and tell yourself the shoulder needed structural support anyway. At least it's neat and tidy, yeh? Ca c'est bon. Note to self: do not make clumsy presbyopic attempts to invent new knitting techniques, especially in lace patterns, when excessively fatigued. I used to do a little lace bobbin work and I take my knitting off the needles and then pin each stitch to the "pillow" opposite the one it should be grafted to. I can then graft away to my hearts content ripping out and adjusting the tenison until I am happy with it. I feel like this is cheating but it does work and it doesn't matter if you get interupted. Ok so wheres the pic ?? You have finished so would be great to see. PS meant to say shoudlers need a bit of stability anyway so three needle bindoff is great!! PSS I prefer Scotch for these moments! !